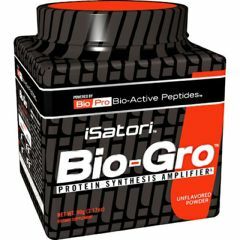 AllegroMedical.com presents The iSatori Bio-Gro - Unflavored Bioactive Peptide Supplement. Bio-Active Peptides. Protein synthesis amplifier. Bio-Pro Bio-Active Peptides (BAP's) are cleaved protein fragments extracted from the highest grade bovine colostrum. The first ever to utilize a highly concentrated, patented form of micro fraction BAP's, Bio-Gro signals the body to amplify the natural protein synthesis process, helping you develop lean muscle more efficiently and recover faster from intense workouts. Contains milk product (colostrum). KEEP OUT OF REACH OF CHILDREN. Do not use this product if you are pregnant, nursing, or contemplating pregnancy. If you, or your doctor, have any questions about this product, please call 1-866-688-7679.Not intended for individuals under the age of 18, unless instructed by a doctor. Consult a physician or healthcare provider before using this or any other dietary supplement or starting any exercise program. Exposure to moisture and humidity may cause clumping but will not affect product efficacy. Do not use if safety seal around cap is broken.